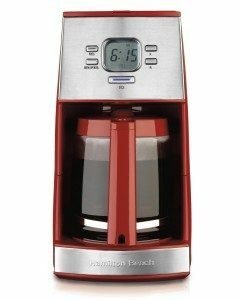 Hamilton Beach 12-Cup Coffeemaker Only $25 (reg. $69.99)! You are here: Home / Great Deals / Amazon Deals / Hamilton Beach 12-Cup Coffeemaker Only $25 (reg. $69.99)! Head over to Amazon and get the Hamilton Beach Ensemble 12-Cup Coffeemaker for Only $25 (reg. $69.99)! Super Saver Shipping will be FREE with an order of $35 or more or get FREE 2-day shipping with Amazon Prime. Note: This price is only for the red coffeemaker, however, it comes in black as well.